I first encountered Sharon Draper's work when I was teaching freshmen who read below grade level. Her books are written for a middle grade audience, but they deal with complex and compelling themes, so they were perfect for my students. Now that I've escaped the teaching profession, I read her books for my own edification and enjoyment. 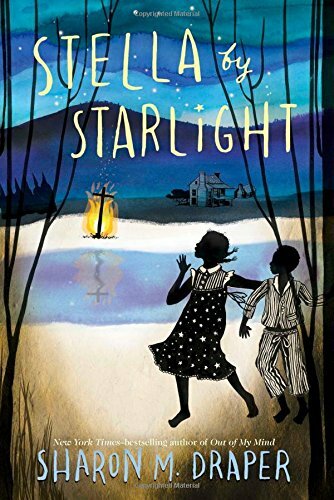 Stella By Starlight may be written with younger readers in mind, but adults will find plenty to like too. It's 1932 in Bumblebee, North Carolina, where Stella Mills lives with her parents and little brother Jojo. Segregation affects nearly every aspect of their lives. Stella and her friends have to walk a mile to school every day, even though they pass by the white school on the way. They have to enter the stores on Main Street from the back door, and some they're not allowed in at all. Stella's father is legally entitled to vote, but poll taxes and intimidation from government officials make it nearly impossible. Still, Stella hasn't ever felt anything but safe in Bumblebee. That is, until the night she and Jojo sneak out of the house and happen upon members of the Ku Klux Klan burning a cross on the other side of the pond. They hurry back home without being seen, but the Klan's activities in their small town are certain to stir up trouble. Stella and her family and the rest of the African-American community will have to decide how to stand up for themselves without putting their lives in danger, a task that may prove impossible. Hate can be a powerful force. The language in the book, particularly the dialect Draper imagines for her characters, is lilting and beautiful. I also love how she weaves song into the narrative, a choice I don't usually like, but which in this case helps bring the story to vivid life. Stella By Starlight engages all the senses, with descriptions of potluck dinners and starry, chilled nights. Most of all it reminds me that there is beauty in brokenness, and that no matter your circumstances, you can comport yourself with dignity and self-respect.